Say What? 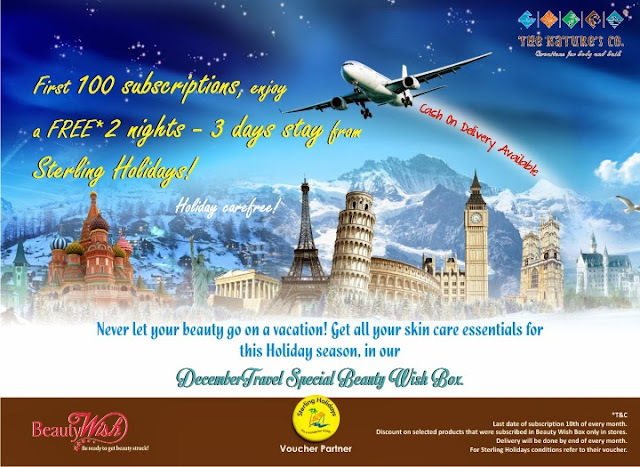 2 Nights 3 Days Complimentary Stay with The Nature's Co Beautywish Box!! It is hard to believe but The Nature's Co Beautywish Box is giving to the first 100 of its December Box subscribers a two nights - three days complimentary stay, sponsored by Sterling Holidays. In November, the theme of the box was winter special and all subscribers got a winter cap as their box. How innovative! December is their Travel Special month and to celebrate they are giving the first 100 subscribers a two nights - three days complimentary stay, sponsored by Sterling Holidays. The Nature's Co Beauty Box contains 6 deluxe size sample beauty products in a dedicated theme from The Nature’s Co. – ranging from hair care to skincare, body care and fragrances – delivered to your doorstep monthly.